For too long, Aboriginal, Torres Strait Islander and migrant communities have faced racism whipped up during elections. Good government is genuinely democratic and representative. Good government unites the community and celebrates our diversity. Good government respects the rights of all, no matter a person's birthplace, language, gender, income, race, sexuality, health or ability. Instead of seeking to represent all Victorians, many politicians are encouraging fear and division to win votes. We are coming together to change this. This Victorian Election, #NoRacismInPolitics calls on every political party and every candidate to build a fair and just future for all Victorians. We will stand together in our collective power and assess every word, action and policy put forward this election, and penalise any politician who discriminates against our communities. Racism is more than just words. It's a system of prejudice that is affecting our communities right now. Promote every person's right to practice their culture, traditions, and speak their language without prejudice. Together, we are a force to be reckoned with. Any party or candidate who will not commit to our values stands to pay the price this election. The #NoRacismInPolitics Joint Statement was launched at a press conference on the steps of the Victorian State Parliament on Thursday 15 November 2018. 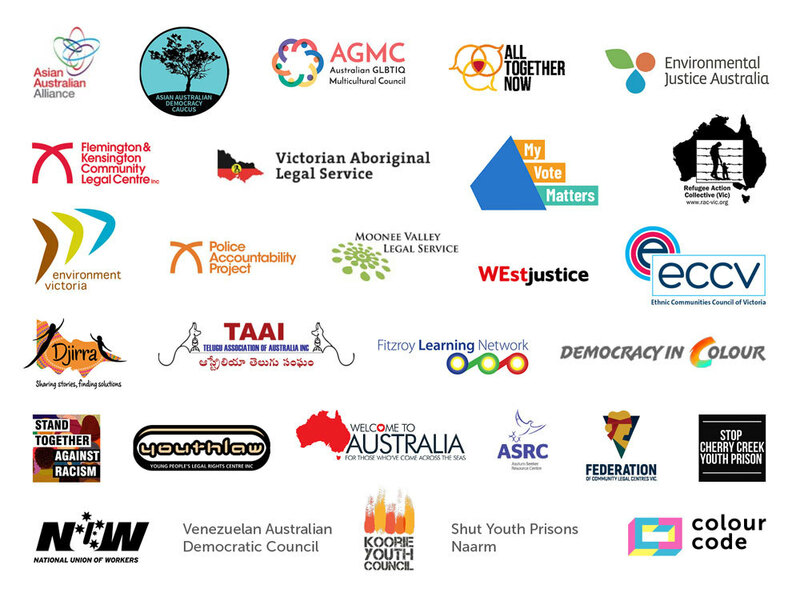 The coalition of organisations stood together to ensure that multicultural migrant and First Nations communities had a voice at the Victorian State election on 24 November 2018. 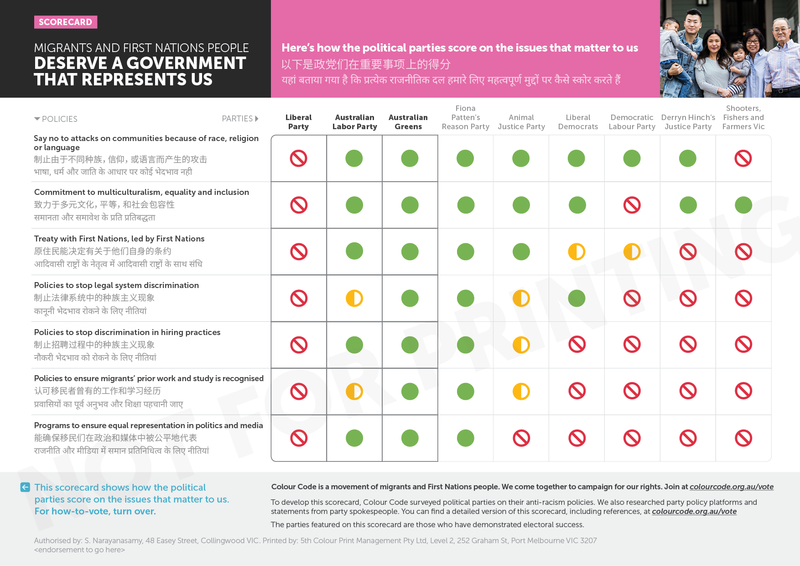 Click here to find out how we independently scored every politicial parties words, actions and policies for this Victoria election.